Rahul dared PM Modi to have a one-on-one debate of just 20 minutes on the Rafale matter, adding that the latter “did not have guts” to stand in front of him as he was lying. New Delhi: Congress chief Rahul Gandhi used former Defence Minister Manohar Parrikar’s purported audio clip to sharpen his attack on the Narendra Modi government and Finance Minister Arun Jaitley accusing the Congress chief of peddling “lies” and “falsehood”. Rahul stepped up the attack on the government, first in the Lok Sabha and then during a press conference, during which he dared PM Modi to have a one-on-one debate of just 20 minutes on the Rafale matter, adding that the latter “did not have guts” to stand in front of him as he was lying. Amid the heated exchange of claims and counter-claims, paper planes flown by opposition members during Jaitley’s speech made an unprecedented sight in the house. Jaitley said perhaps the Congress members were throwing paper planes in the memory of Euro Fighter, which was also in the race along with Rafale. The Rafale deal issue is to conclude on Thursday with the reply of the government. The Congress has issued whip to its MPs to be present in both the Houses as apart from discussion on Rafale issue, key issues such as the triple talaq bill are likely to come up in the Rajya Sabha. 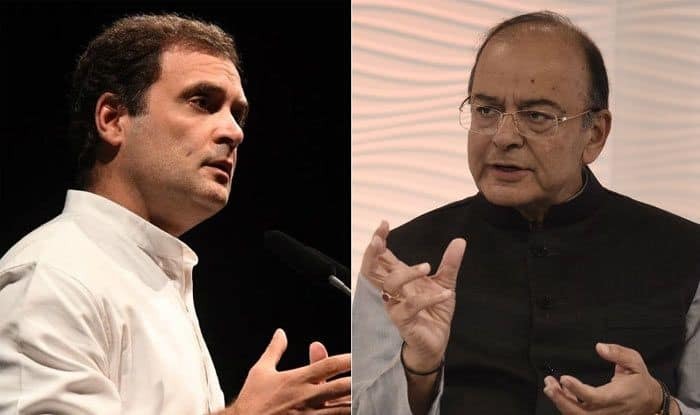 The Lok Sabha witnessed a high-voltage drama over the Rafale controversy with Rahul Gandhi saying that Prime Minister Narendra Modi “does not have guts” to face questions in Parliament and Finance Minister Arun Jaitley accusing the Congress chief of peddling “lies” and “falsehood”. In an embarrassment to the Narendra Modi government, its ally Shiv Sena also supported the Opposition’s demand for a joint parliamentary committee (JPC) into the Rafale deal, claiming that people say the aircraft is good but the deal is bad. Questioning the Prime Minister over the Rafale deal, Rahul said, “Rafale was chosen after eight years of work done by the Indian Air Force (IAF). 126 aircrafts were needed but the dead was chopped down to 36. Why? Did the national security change or did the IAF ask the government that we do not want more planes? Rahul said that the whole nation is questioning the Prime Minister over the deal and demanded a JPC to probe the deal. Following Gandhi’s hard-hitting attack on the government, Jaitley led the government’s charge in a scathing counter- attack as he referred to alleged defence scams during the Congress rule and said “conspirators” of past defence scams had the “audacity” to target the Modi dispensation. He also ruled out a JPC probe- a demand made by most opposition leaders, including Gandhi- saying there was no need for it as the Supreme Court has already satisfied its “conscience” on the issue. Targeting Gandhi, the BJP leader said he would have played in the lap of ‘Q’, an apparent reference to Ottavio Quattrocchi- allegedly invoved in the Bofors case. Jaitley also mentioned the recent disclosure allegedly made by AgustaWestland accused Christian Michel and referred to terms like “Mrs G” and “the Italian lady” and “her son” to attack the Congress leadership. Attacking the Congress president, he said “There are some people who have a natural dislike for truth. Every word spoken for the last six months on this subject, including in this House (by them) are false…. He has a legacy of speaking falsehood”. Jaitley also questioned Gandhi’s “knowledge” saying he and his family only understand the language of money and not of national interest. “How did a Rs 5,000-crore aircraft become a Rs 1,600 cr aircraft is the question being asked. It’s sad that the head of the grand old party of India does not understand kindergarten arithmetic,” Jaitley said, later again attacking Gandhi saying “Rahul Gandhi’s class would have to begin from A, B and C”. The House also witnessed high drama after Gandhi sought the Speaker’s permission to play an audio tape, purportedly of a Goa minister, on the Rafale deal. Jaitley said the tape is “false and fabricated”, asking Gandhi if he can authenticate it. He may have to face privilege motion and even expulsion in case it turns out to be fabricated, the BJP leader added. Amid an uproar, which caused brief adjournment of the House proceedings, Gandhi said he would not play it and authenticate it, prompting Jaitley to say that he was “scared” as he knew it was false. Jaitley claimed that the NDA government struck the deal under better terms as compared to the UPA government, claiming that the present deal was 9 per cent cheaper than what was finalised by the Congress government earlier. Rahul Gandhi addressing a press conference hours after he spoke on the issue in Lok Sabha to respond to the charges levelled by Jaitley. The Congress chief again used the purported audio clip to allege that Goa Chief Minister Manohar Parrikar is “blackmailing” Modi with a file on the Rs 58,000 crore jet deal “lying in his bedroom”. Citing an audio clip of a conversation purportedly of Goa minister Vishwajit Rane, Gandhi said he can be heard clearly as saying that Parrikar told his cabinet during a meeting that all documents relating to the Rafale deal were with him. Asserting that the audio was authentic, Gandhi indicated there may be more such tapes and dismissed denials by Parrikar and his minister. He also dared Modi to have a one-on-one debate of just 20 minutes on the Rafale matter. “What Parrikar is doing is threatening the Prime Minister and blackmailing him in a way. We have been raising this for a long time. Question is what information is there in Parrikar’s bedroom and what files are there and what could be the impact on Narendra Modi,” Gandhi alleged. He also asked who raised the price of Rafale aircraft from Rs 526 crore to Rs 1,600 crore. He further alleged that PM Modi benefitted his “businessman friend” Anil Ambani by handing over contract after snatching it from the HAL. “Anil Ambani, who never manufactured an aircraft, was given the contract while HAL, which has been manufacturing aircrafts for the last 70 years, was sidelined. Whose decision was this?” questioned Rahul Gandhi. Meanwhile, Jaitley, in a series of tweets, took a dig at Rahul Gandhi saying that it was foolish to compare prices of a simple flyaway aircraft with a weaponised jet. “Even a fool will not compare prices of a simple flyaway Aircraft with a weaponised Jet,” Jaitley said. He further said that even in the offer made to the UPA government there were two different prices — one of the flyaway aircraft and the offer of the weaponised aircraft. Jaitley also accused the Congress of comparing “two unequals” and calling it a ‘scam’. Paper planes flown by opposition members during Jaitley’s speech made an unprecedented sight in the house. Rahul alleged Manohar Parrikar is "blackmailing" Modi with a file on the Rs 58,000 crore jet deal "lying in his bedroom". Jaitley questioned Gandhi's "knowledge" saying he and his family only understand the language of money and not of national interest.